Sir Brian Hoskins, CBE FRS, is an international authority on climate, and is a member of the Science Academies of the USA and China as well as the UK. He has been Professor of Meteorology at the University of Reading since 1981. In 2008, he become the first Director of the Grantham Institute for Climate Change at Imperial College, London and is now its Chair. His international roles have included being Vice Chair of the Joint Scientific Committee for the World Climate Research Programme and President of the International Association of Meteorology and Atmospheric Sciences. He has had numerous UK roles, including membership of the Royal Commission on Environmental Pollution, and is currently a member of the UK Committee on Climate Change. The scientific evidence supporting the theory that various gases help prevent heat from escaping from the earth, thereby warming it, goes back to the nineteenth century. The principal “greenhouse gases” are water vapour, carbon dioxide (CO2) and methane. CO2 accumulates in the atmosphere over centuries, much longer than methane and water vapour cycles through in days. Evidence shows that the CO2 content of the atmosphere has doubled since pre industrial times during which the earth’s temperature has increased by about 1C. Attention has therefore concentrated on CO2 and what can and should be done about it. 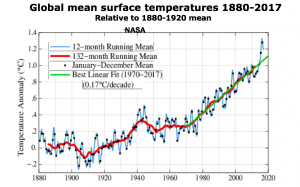 There have been rises and falls in temperature over the years but the longer term trend is quite clear. Almost everywhere on earth has seen a rise with the land a bit more and the oceans a bit less. Sea levels have risen by about 20cm partly because of the melting of the ice caps. At the present rate the permanent Arctic ice cap will have disappeared in late summer by the middle of this century. The rise in sea levels also reflects the heating of the water which expands as it gets warmer. Heavier rainfall and stronger tropical cyclones are consistent with a warmer atmosphere and ocean. For the future, if nothing is done and CO2 emissions continue as in the past temperatures could rise by 5C compared with pre industrial levels. Again the rise would be higher over land, lower over the oceans. Sea levels could rise by as much as 1m, but perhaps double this if the West Antarctic Ice Sheet proves to be unstable. The next Thames Barrier is planned to cope with a 2m rise. Rainfall intensity would increase appreciably as well as the acidity of the oceans with serious effects on sea life. Agriculture would need to change substantially with many areas subjected to drought and flooding. This would lead to population movement and accompanying economic and political conflict. Effective action requires agreement at international level. The Paris Agreement of 2015 declared that the aspiration should be to limit the temperature rise to less than 2C. Each country gave voluntary pledges to limit their CO2 emissions. The trouble is that the pledges do not go far enough and since then President Trump has pulled the USA out of the agreement. Perversely, Trump’s decision has, in the short term, led many other countries and US states to take more action. In the UK, the Climate Change Act of 2008 set a target of 80% reduction in CO2 emissions by 2050 compared to 1990 emissions. Some other countries have followed the UK’s example. Power generation is increasingly based on low or zero carbon such as wind and solar power, electric cars are catching on, and business is increasingly seeing opportunities in the new technologies such as solar power, carbon capture and more efficient batteries. Despite this progress, there are immense challenges, technological, political and economic, including the impact that even a significant slow-down in warming will still bring and what can reasonably be expected from poorer countries who naturally feel that they have much to do to catch up with the rich west. There are also some developments which would make the situation worse, such as the change to a western style diet of more meat and dairy foods in much of Asia and Africa which would require more livestock and hence more methane emissions adding to greenhouse gas emissions.